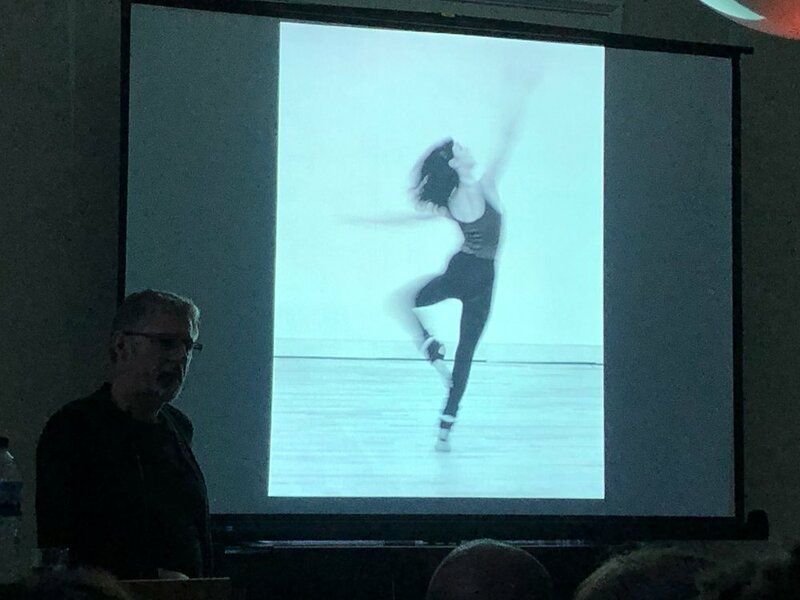 Chris Nash at Bell House showing the first dance photograph he ever took - which won first prize in a photography competition. Having trained at Goldsmiths School of Art, Chris Nash became a dance photographer by accident. Initially he was just taking photographs of his sculptures and people at the college. In 1978 he put a picture of a dancer into a competition and to his surprise he won first prize and £50 and decided he might have a future in photography. It was Nash’s artist training which shaped his career as a pioneer in dance photography. Lots of Chris Nash’s early work was at the newly formed Pineapple Studios and he was, of course, working with “real” film. He was an experimenter, trying out different film and different shutter speeds and printing with over- and under-exposure. However, Chris Nash was no Luddite - when digital came along he welcomed it, treating it as a wonderful new tool, and a great time saver. After Pineapple Studios he began doing press photos but found it unsatisfactory because the dancers were moving around too much and he was simply taking the same pictures as the other reporting photographers. So he decided to do his own thing - experimental pictures working much more closely with the dancers in their studios, often with innovative dance groups and avant guarde dance directors like Michael Bach. Usually he’d be helping them promote their dancing so he would be taking the pictures at an early stage. His own visuals often would then influence how they shaped their actual dance.